When I saw the cover for this book on NetGalley, I thought it was cute. I mean, two kids sitting on the back of Pegasus in star constellation form? Adorable!! When I read the synopsis, I went “Hmm”, would this be a book that my 9 and 11-year-old like?”. So, I requested this book and I was thrilled when I got selected to review it. What I liked that there was a bit of steampunk in the book. If you have followed this blog, you all know how much of a fan I am of steampunk. So I was thrilled when I saw that there were airships and other steampunk elements in the book. The bees were probably the coolest part of the book. They were all mechanical and acted like real bees. Except they didn’t make honey, they tracked down the Mordant’s and reported where they were to Captain Nautilus. 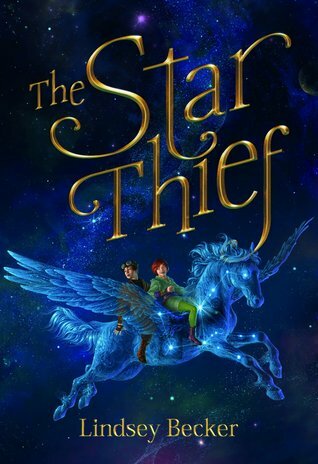 I loved the use of the constellations in The Star Thief. What a great way to get kids to look to the stars and track the constellations. I even got into it, googling the names of the various characters and seeing what constellations they were attached too. There was a lot that I wasn’t aware of (not that I know a lot about constellations). Like I said, it was truly fascinating. Honorine was a very spirited girl. She had been raised in the Vidalia (yes, like the onion…lol) household with her best friend, Francis, and worked there as a maid. She loved inventing and dedicated her free time to doing so. She was also very spunky and knew her own mind. So when the Mapmaker showed up to “save” her, she questioned him. And she questioned his motives during the entire book. She was a very smart girl. I was a little shocked when it was revealed who Honorine’s parents were. Actually, a little shocked wasn’t the word for it. I did feel a disconnect when she actually met her parents. Maybe because they weren’t like “Oh my baby girl, I have searched for you” and smothered her with kisses. Instead, her father wanted to use her for his own agenda and her mother, well, she wasn’t very motherly….lol. The end of the story was full of action and I liked how everyone had an HEA….including the bad guys. Why: This is a perfect story for any child between the ages of 8-12. The storyline is great and keeps your attention and the characters are likable. The drawings at the beginning of each chapter are beautiful and I can’t wait to see them in paperback (I am pre-ordering for my son). Why: some very mild violence and one scene where Honorine is hurt that might upset some younger readers. Other than that, a perfect children’s book.